In the eight and a half months since we left them in Bumped, Harmony and Melody have become the most famous teens in the world, known as The Hotties. As twins who are pregnant with twins, they are swamped with endorsement deals for perfumes and energy bars, hounded by paparazzi, and copied by everyone who follows them on the MiVu. Yet they both are hiding secrets and stand to lose everything if they face up to their lies. It took me a few pages to get back into Megan McCafferty's world where pregnant teens reign. 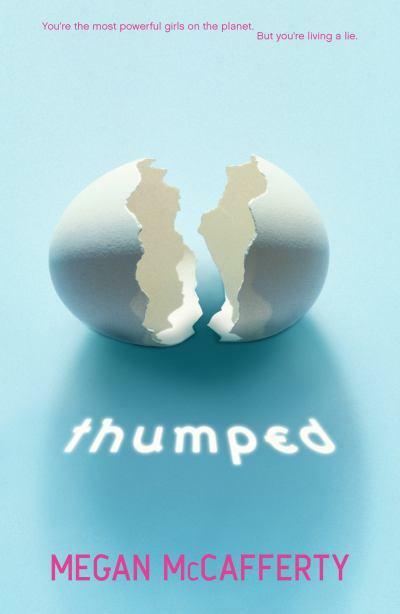 Once I remembered the slang: "pregg", "dose," and "FunBumps," I settled in to enjoy the end of the twins' story. As always, McCafferty's humor is a highlight. In referring to her school bus, Melody says, "The Bumpmobile's horn is notoriously obnoxious. We call it the waterbreaker." The author has considered every detail and how it contributes to the atmosphere. Surprisingly, Harmony became my favorite character. She spent much of the first novel speaking only in Biblical verse, but her time on the Otherside has changed her. She has begun to question the rules of the devout community she lives in. While she never loses her belief in God, she wonders if the rigid rules are necessary. She says, "I thought maybe, just maybe, I could find someone else here who sought a different relationship with God. I've only recently begun to accept that I'm the sole doubter among us." Her progress throughout the series feels like a realistic (if slightly exaggerated because of circumstances) development of faith. Thumped is a book you will read in one sitting, urged along by the short chapters and rapidly unfolding plot. This book was provided by Young Adult Books Central. Read this and more reviews here.